Blue pillar box, originally uploaded by fred pipes. Today's quiz. 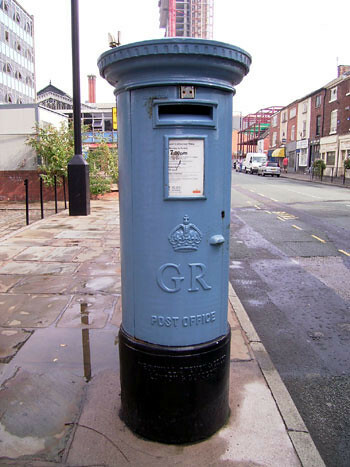 This is a genuine working pillar box on the streets of Manchester, but why is it blue? No photoshopping has been used on this photo! Well, nobody got the right answer! It is a homage to the 'Air Mail' pillar boxes back in the days of yore. It's outside the Air and Space Hall of The Museum of Science and Industry in Manchester's Castlefield.